It’s pronounced boon chaaaaah with a nasally vowel sound. It’s also the first Vietnamese food I sampled after moving to Hanoi and quickly became my all-time favorite. My Vietnamese coworkers introduced me to “noodles grilled” at a street food restaurant whose bedraggled authenticity nuked my western sensibilities into submission. I lowered myself onto a tiny blue squat stool near the some laundry hanging out to dry and prayed to any deity out there listening to protect me from a later trip to the almighty porcelain god. I am pleased to report all ended well that afternoon and so began my Vietnamese culinary journey. That particular restaurant eventually closed and I’ve since moved on to Saigon but my cravings for bún chả remain strong as ever. So what is bún chả you are surely asking by now. Don’t worry, we’ll get there. As with anything in Vietnam…Patience! I asked two Hanoi based cabin crew where their hometown’s best bowl of bún chả lurks, and without hesitation Mr. Long wrote down Bún Chả Hàng Mành on Hang Bong Street. He said showing anyone this well known name will direct me right to it. I dragged my friend Allie deep into the Old Quarter and showed several people our piece of paper with the restaurant’s name. Of course no one even pretended to know what we were looking for. Hanoi makes New York seem like a neighborly Wednesday night pot luck church supper in comparison. About 15 annoyed people later we were about to give up when Allie spotted a Hàng Mành Street and suggested we try there. Lo and behold we walked up on Bún Chả Đắc Kim selling the grilled pork patties we had just wasted 30 minutes looking for. 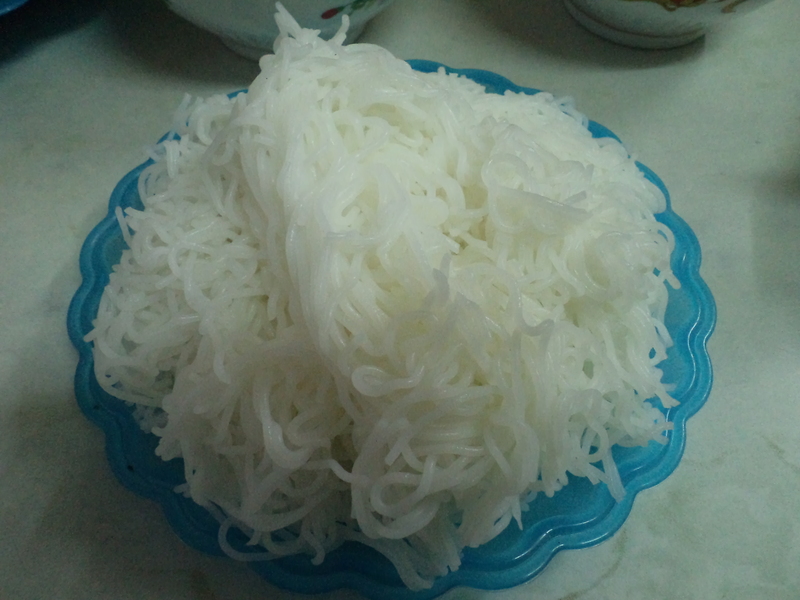 Well it’s not on Hang Bong Streey but Mr. Long had mentioned Hàng Mành so is this maybe the famous pork altar he meant? So…As to bún chả…Picture it…A grill out on the sidewalk with an electric fan heating the coals perfumes the neighborhood with oily white smoke. A woman grips the handles of two small grill baskets filled with tiny meat patties and flips them back and forth over the hot embers while calling out “boon chaaaaah, boon chaaaaah” to anyone within earshot. The delicious smell of minced pig and spices grilling to soft juicy perfection draws hungry passersby right in to some tight seating. Suddenly a tableside feast arrives with bowls and plates of fresh herbs, white slightly sour rice vermicelli, pickled green papaya in fish sauce, and the star itself, sweet chargrilled pork. This scene plays out daily at bún chả joints all across Hanoi. 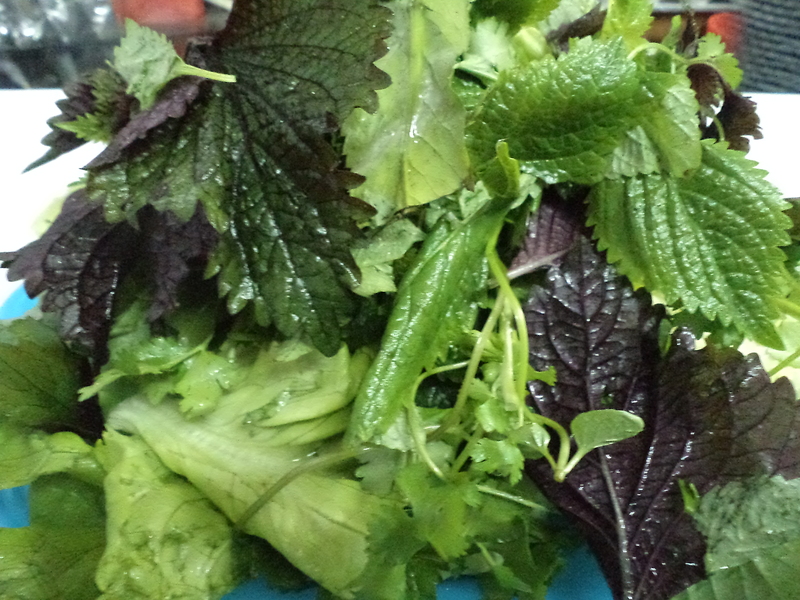 So after a 9 month separation, an overdue reacquaintance with my favorite Vietnamese food began anew with the sweet scents of saw tooth herb (like cilantro but stronger), mint, Thai basil (cinnamony), Vietnamese balm (lemony), purple perilla (sweet/bitter), bibb lettuce and cilantro. How much would a foot high mound of these fresh herbs set us back in the US? I can’t even imagine the hole they’d blow in our wallets. 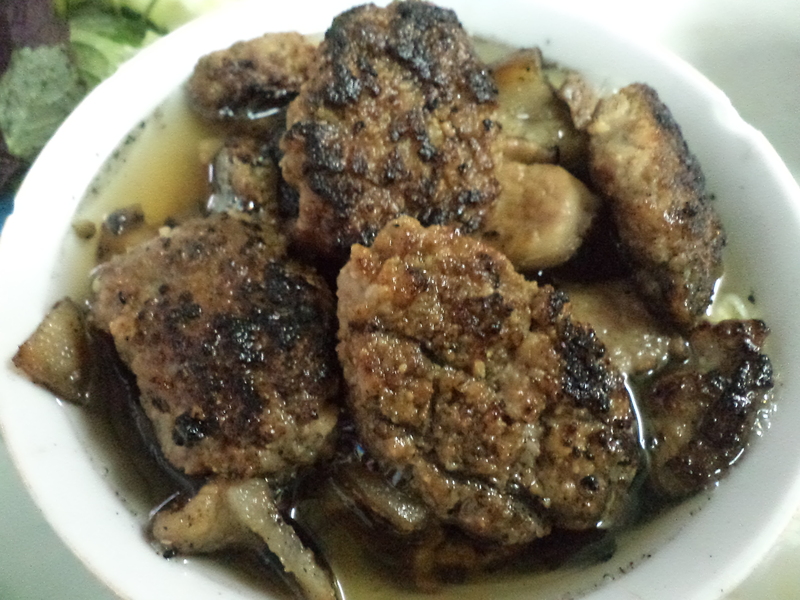 The small charcoal seared pork patties and thin crispy edged pork strips floating in a bowl of golden fish sauce diluted with sugar, water and maybe some vinegar pair up perfectly with the herbs, perilla being my favorite. I will find a recipe for this one of these days because a life in America sans bún chả just seems so sad and empty indeed. Look for me one day in the USA wearing a conical straw hat at my condo’s poolside grill pit barbecuing grill baskets of this stuff with back and forth flicks of my wrists while yelling “boon chaaaaah” over and over to my confused neighbors. For less than the cost of four Taco Bell Bean Burritos, Allie and I sucked down a much more delectable feast. Mr. Long had told me bún chả tasted better long ago. His comment mirrors a common perception here in Vietnam…people say today isn’t as good as yesterday. I don’t know…Allie and I quite enjoyed our present day lunch of wrapping pork in herbs and dunking it along with noodles into the fragrant broth. We aren’t sure if this is the restaurant he had in mind, but the food was fantastic none the less. We may see bún chả pop up again from time to time on this food journey as I now am on the quest to taste if my fellow Saigonians in the south can properly duplicate my beloved specialty of the north.